1. From the bottom of the ratchet strap slowly thread the webbing through the slot in the center of the spool of the closed ratchet. 2. Next pull the webbing through and remove the excess slack or loose webbing to make a firm but not tight webbing. 3. Begin to crank the ratchet handle up and down to tighten the ratchet strap in to place. You will want to make sure the item you are transporting is snug, however not too tight that it damages your cargo you are transporting. 1. To release the ratchet strap, pull and hold the tab on top of the ratchet assembly to override the ratcheting function. 2. Open the Ratchet until it is completely open and the ratchet is laying flat. 3. Grab the polyester tie down webbing from the nonfixed side and begin to pull to pull the webbing to release. 4. Pull and hold the release tab on top of the ratchet to close the ratchet. A working load limit is the amount of force that it takes to break a tie-down divided by three. This gives you extra room for errors to occur such as a load shift, a sudden lane change, or a sudden stop that could cause the tie-down strap to break. This is the leading way to determine that tie down straps are either safe or not safe to use given the amount of weight that your cargo weighs, paired with the perfect tie-down strap for your application. 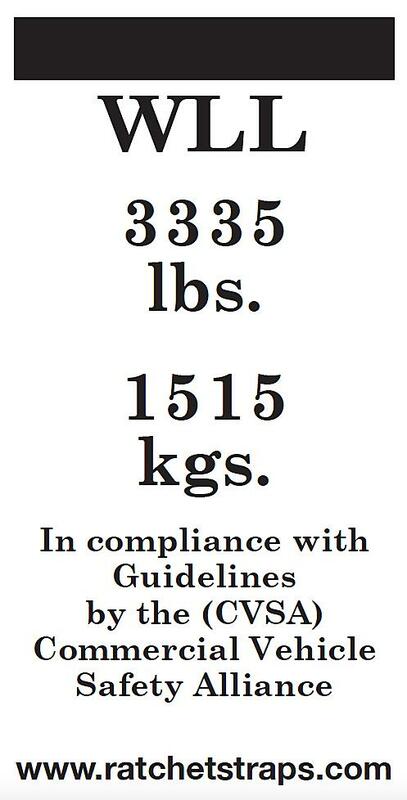 An example of the working load limit would be a 10,000-pound breaking strength strap would have a 3,333-pound working load limit. It is important to note that the working load limit was put in place by the Department of Transportation in order to keep everyone on the road safe. Before a Working Load Limit created there was a large risk of danger from Semi Trucks, Tractor Trailers, and cargo placed in the place of pickup trucks. You can find more about cargo securement from the Drivers Handbook on Cargo Securement here. Pictured above is a picture of what a Working Load Limit tag or label will look like on a reputable tie down strap. Remember, the working load limit determines the amount of weight that the strap can secure safely. If a Working Load Limit tag is not present the strap is unsafe to be used and should be replaced with a reputable tie down strap. Depending on the state that you live in you could face stiff penalties for not having a visible and clearly legible working load limit tag. Also, a vehicle should always comply with the Commercial Vehicle Safety Alliance standards. If a Tie Down Strap does not comply with the Commerical Vehicle Safety Alliance (CVSA) then you are at risk of securing cargo while using commercial vehicles. You can find more information about the CVSA guidelines and more information about some of the safety guidelines they highlight on here. When storing a Ratchet Strap it is incredibly important to always make sure the area you intend on storing the ratchet straps in is in a cool, dry, mold free area that is not in direct contact with the sun. Tie down straps webbing can fade over time when in direct contact with the suns UV rays that could cause the tie-down strap to fade in spots that may jeopardize the safety of your tie downs by weakening the webbing. It is important to ALWAYS avoid any wet areas when storing your tie downs as mold and mildew can form that can severly damage your ratchet straps and may cause them to not be able to be used over time. The ideal way to store ratchet straps would be in a storage container, in a ratchet straps duffle bag, or another area similar. Some of our customers over the years have even used socks to store their ratchet straps, as well as to be neatly organized throughout the process. Some of the other alternative ways include zip lock freezer bags, tool boxes, and rubber bands just to name a few. It is important to always remember that the more organized than the ratchet straps are stored the easier it is to reuse the ratchet straps, as well as keeping the strength of your ratchet straps by preventing any friction from occurring that may weaken or even in some cases damage your ratchet straps. Threaded ratchet strap wrong? If you find yourself needing to fix a jammed ratchet strap the best way to untangle the ratchet strap is to remain patient and work on grabbing the excess webbing that has become tangled inside of the ratchet strap out of the tie-down strap. One of the best ways to make the ratchet strap that is jammed unjammed would be to use pliers on the bolts on the outside of the ratchet to loosen the webbing enough to take it out so it is no longer stuck. Remember the reason that ratchet straps become jammed is due to the ratchet strap being overwrapped, chances are it wasn’t unwrapped before it was tightened again. You can use needle nose pliers into the roll of the strap that was wound too tight to move the strap out of the device. One of the best tips to help prevent any excess webbing from becoming jammed in the ratchet strap you can simply remove all excess slack before you begin to ratchet. Remember to use the least amount of tie-down webbing for your application as possible inside of the ratchet mechanism to prevent the ratchet strap from becoming tangled and hard to remove later when you plan on removing or loosening the ratchet strap. In order to get the wad of webbing out from the windless of the ratchet strap pull the ratchet straight and begin to pull the webbing and eventually friction will help wiggle the excess webbing out and will be able to be used again. However, this may take a little bit of frustration and some time in order to pull this off. That is why it is extremely important to make sure that you do not thread too much webbing when ratcheting. Some of the most important helpful ratchet strap tips include storing your ratchet straps on the passenger side of your truck, van, or vehicle of choice. This is due in fact too if your load were to shift and you were to need to get out of your vehicle to retie down the load that you would be on the passenger side of the vehicle away from the road that would give you great safety added benefits. This prevents you from being on the traffic side of the vehicle in case you need to pull over to make some adjustments to your straps. Another great tip for ratchet straps is to always make sure to always keep your ratchet straps secured from four different locations on the cargo. This helps prevent against potential load shifts, an unbalanced strain on your tie down straps, and provide an extra great layer of peace of mind by having extra fail-safes. A fail-safe is if something were to go wrong you have an extra layer of protection to help prevent any damage from occurring to your cargo or other motorists. Remember that safety is always the number one priority when shipping cargo. If you have any questions regarding any tie down straps that will work with your application, give our tie-down experts with over 25 years of experience a call at 800-483-2189 and we will work to help fulfill your cargo application needs. Ratchet Straps are typically made to fit the majority of cargo securement needs, however, sometimes there is a need for an extra heavy load securement or oddly shaped cargo which may need some extra ratchet strap assistance through custom-made ratchet straps. Some of the perks to using Custom Made Ratchet straps compared to traditional ratchet straps is they are made for your application needs that some traditional ratchet straps may not be able to offer or be able to cater to your load needs. Custom made ratchet straps can be found in all sorts of different lengths of webbing, different widths of webbing such as 1 inch, 2 inches, 3 inches, and our strongest 4-inch tie down webbing that helps meet a variety of different cargo needs, and hardware that fits your application best. We also have some customization choices with our webbing such as our stenciling capabilities to put just about any sort of words on a ratchet strap webbing so others know who straps they belong to. 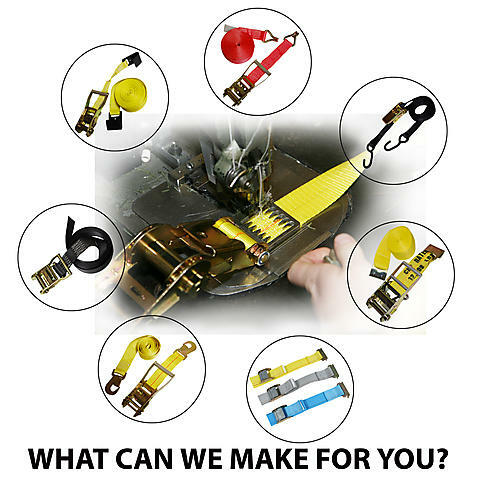 If you have any questions regarding any of our custom made ratchet straps or custom made tie downs give our custom ratchet straps team a call at 800-483-2189 and we would be happy to assist you with making the perfect made strap. When selecting the right ratchet strap you will need to be assured that the ratchet strap that you choose is capable of holding your cargo down without breaking. The key to picking out the perfect ratchet strap is by always picking the ratchet strap that has a rating higher than the weight of your load. You will also need to secure the cargo from four different points to balance the workload so it’s important to make sure you are purchasing enough ratchet straps to get the job done right. It’s important that you always have too many tie down straps than not having enough straps to get the job done right, as well as getting the job done safely. Loads can often shift during transportation so you never want to secure from just one side of the cargo as well. What should you do with Ratchet Strap Loose Ends? When securing cargo it is always important that after you make sure your load is secured you do your best to secure your loose ends of extra webbing or slack. When the polyester webbing is not secured you become at risk for the loose tie down webbing to rub and create friction that could severely damage your ratchet straps from lasting. As well as securing the loose ends of the ratchet straps when transporting cargo you should always do your duty of a safe cargo transporter by double checking your ratchet straps after a couple miles. This is to check or relook at any potential load shifts or cargo straps that may have moved due to potential stretching in some cases. One of the most overlooked ways that load shifts during transportation are actually caused by the wind and the potential road bumps you may hit during your journey across town or across the world. The best guide to follow when using tie downs is always checked once before leaving to make sure everything is secured properly as you get ready to travel. After going down the road for a few minutes or by the time you reach 2 to 3 miles to pull over when it is safe to do so and recheck the tie-downs to make sure nothing has shifted and all of the tie downs are secured tightly. Make sure to also check out some of our other blog posts where you can find other great tip and tricks for tie downs and our ratchet strap blogs. Did you know by creating a half twist on your ratchet strap when transporting can actually make your ratchet straps more secure? When putting a half twist in the ratchet strap this reduces the flapping of the ratchet strap. This not only keeps your ratchet straps more secure when transporting but this could also help make your ratchet straps last long by having your straps not rub against sharp corners or create heat from friction that could make burns on your tie downs that may cause the ratchet straps or tie-down straps need to be replaced due to becoming unsafe. Ratchet Straps Half Twist prevents the wind from moving the tie down straps which could create a polyester tie down strap webbing rubbing against a sharp edge. Not only could this cause possible friction, but it could cause severe burns in your tie down webbing due to the amount of wind these straps endure during transportation. The way that the ratchet straps half twist works are through the method of preventing harmonics from forming around the ratchet strap. What are harmonics? Harmonics are the wind effect that is caused when the wind hits a surface that it can not flow through. An example of this would be a brick wall preventing winds from passing through such as a fence around your yard that allows wind to flow through. When the wind has a harmonic field this can cause wind damage to occur, tie downs, in this case, to become weakened, as well as a place of incredibly strong winds and wind gusts. The reason that wind can cause damage to your tie down straps is due to friction. When the wind is moving your tie down straps back and forth going down the road it can cause the ratchet straps to move side to side or up and down. This creates friction if at any time ratchet straps rub against any of the surfaces that they touch against a sharp surface. Friction can end up causing burns similar to what fire can do in terms of damage due to the extreme amount of heat that the friction can cause the ratchet straps. This is why it is crucial to always inspect your ratchet straps for any notice burns on the polyester tie down webbing before using and before storing. If you have any questions regarding how to inspect your ratchet straps or any other questions about using Ratchet Straps give our Ratchet Strap Experts a call at 800-483-2189 and our team will be happy to answer any questions you may have regarding any of our products. You can also visit our How to inspect your Ratchet Straps Blog to see more tips on how to inspect your ratchet straps for damage, as well as some useful tips to avoid damage to your tie-down straps. We also go further in depth on when it is time to replace your Ratchet Straps for potential damage that may occured and how to save potentially have your ratchet straps by purchasing Replacement Straps instead. Saving you money and keeping your cargo safe on the road as well! Did you know that Cam Buckle Tie Down Straps are different than traditional Ratchet Tie Down Straps when it comes to cargo securement? The main difference between Cam Buckle Straps and Ratchet Straps is the method they use in order to secure cargo. Ratchet Straps utilize a Ratchet Mechanism that clicks with every rotation to tighten the cargo and remove excess slack in one direction by using the teeth design on the ratchet. This allows the ratchet to spin clockwise that prevents cargo from unwinding or loosening itself during transportation until the ratchet mechanism is unlocked by opening the Ratchet until it is completely flat. This would allow for the webbing to be pulled out of the ratchet mechanism and now allow for the cargo to be unsecured. Cam Buckle Straps, however, utilize the technique of never being able to tighten cargo too tightly. This helps shippers transport cargo without having the risk of damaging the cargo during shipping. However, there is a small downside to using Cam Buckle Straps as they are typically only able to holder lighter weight cargo compared to Ratchet Straps that can have a much higher working load limit. You can visit our full Cam Buckle Strap selection here or if you are interested in learning more about our Ratchet Straps you can learn more about them here. Finding if Cam Buckle Straps or Ratchet Straps work better for your application really relies on what you are attempting to secure. If the cargo is lightweight and it more brittle or could be damaged during transportation then Cam Buckles are likely going to be the better choice of cargo securement straps. 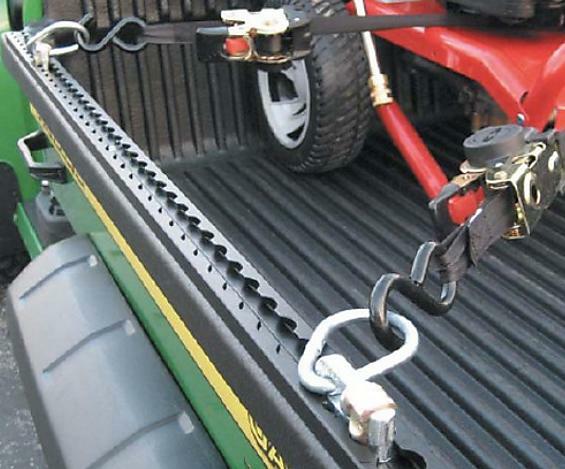 However, if the Cargo is heavier and needs more strength in order to keep it secured such as on the back of a Flatbed truck or Tractor trailer then you will want to look into Ratchet Straps or Winch Straps to help secure your cargo. If you have any questions regarding what strap will work best for your application and would like to have an expert opinion on tie downs, please give our tie down experts a call at 800-483-2189 and our team will do our best to help find the best strap for your cargo securement needs. When calling it is important to know the weight of the cargo you are planning on securing. Without this information, it makes it incredibly hard due to tie down straps all having different working load limits based on different hardware options. Remember, tie downs are only as strong as the weakest link on the strap. Ratchet Straps USA has also been a leading manufacturer of ratchet straps for over the last 25 years. So if you need a custom made ratchet strap for those custom applications we can custom make just about any kind of strap to help you get the job done. 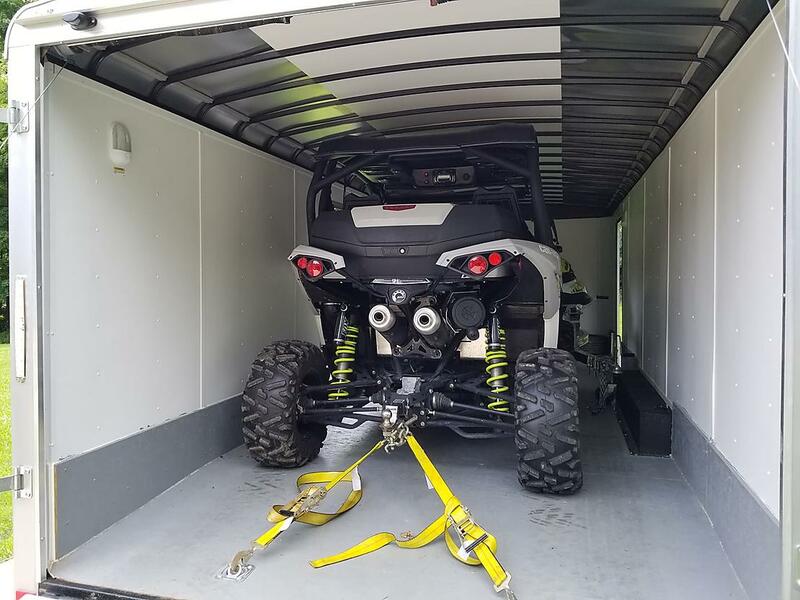 No matter if you are looking for cargo securement, motorcycle or ATV securement, or looking to transport a vehicle we have a wide inventory to get just about any job done. If you have any questions or need some input on a tie down you can call our experts at 800-483-2189 or contact us by using our online contact form located here. When it comes down to knowing the best way to tie down luggage to a roof rack it can be quite difficult due to the number of extra variables that you need to think about that come in to play. Some of these variables include extreme amounts of wind, making sure the roof rack does not come unsecured, and if there was a sudden lane change the shift in the load would be greater due to its height. There are many ways to secure tie down luggage on roof racks such as using tie down rope, but the best way can be decided on the weight of your load. Due to the risk of luggage blowing off toward other motorists it may be a great idea to aim for 2 inch ratchet straps instead of the traditional 1 inch ratchet straps. When it comes to working toward the working load limit you never want to exceed this limit. It is set in place by the Department of Transportation for your safety and other motorists safety as well. The reason that Ratchet Straps are the preferred method of transportation for roof racks is the ratchet mechanism prevents any potential cargo becoming unsecured during transportation due to the ratchet mechanism only traveling clockwise in one single direction. This prevents cargo from loosening from heavy winds or from harmonics that could move the ratchet straps around in the wind around the cargo roof rack. • Inspecting your Ratchet Straps for potential defects in the tie-down webbings such as burns, mold or mildew, or any other frayed webbing on your tie downs. • You should also always make sure to inspect your ratchet mechanism as well for any damage such as dings, missing metal chunks, or corrosion on your metal ends. Although this is extremely rare that the Ratchet Mechanism is defected it possible over time that it may need to be replaced. 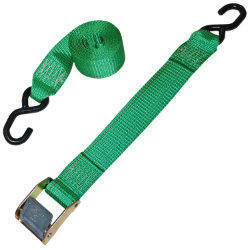 • Keeping your Tie Down Straps in a dry environment can do wonders to your tie down straps lifespan. By storing Ratchet Straps inside of a dry warm space that is away from the elements can greatly improve the life expectancy of your tie downs. • Another great way to maintain your ratchet straps is by using rubber bands to keep your tie downs organized and to prevent friction from occurring that could cause burns to occur if not organized as well as knots. • You can also use lubrication such as silicone spray to help the ratchet mechanism and ratchet handle full assembly from sticking. This can also be done through the use of WD-40 or other similar sprays. 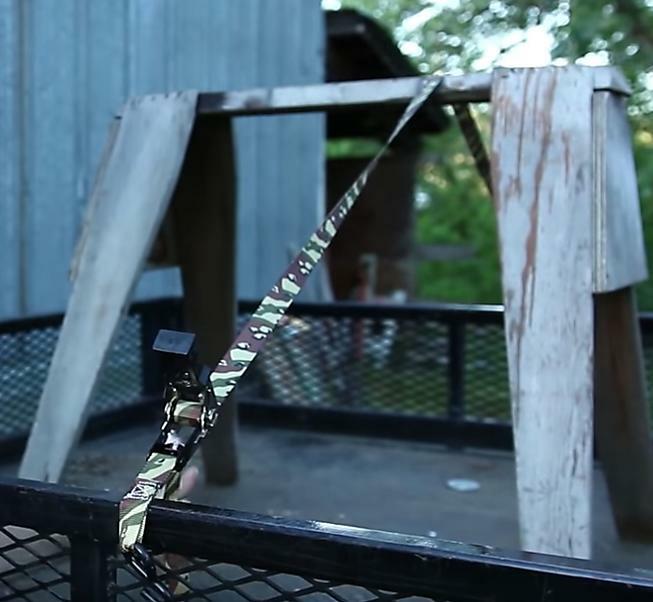 Some of these tips can greatly improve the lifespan of your tie down straps. As ratchet straps become older they are more prone to damage occurring to them that could prevent any chance of the tie down straps from being reused. In the circumstances that your tie down straps do become damaged, you can buy replacement straps that help you replace the broken part. This not only saves you from buying a completely new ratchet strap, but it can also help save part of the tie down that was perfectly good still. You can find more information on our replacement straps here.